This page contains the VT-2004 News Archive , which all messages that were displayed in the right column of the top webpage, informing about the progress of this programme. They are here listed in reverse chronological order. The very comprehensive VT-2004 Photo Archive has been updated and is now in its final form, with more than 600 photos. Two more thematic pages were added. The last "Theme of the Week" has been published. The winners of the Video Contest are known!. You will find who they are on the page of the Venus Transit Experience, a conference that summed up the vast experience gained through this unique programme. Today, ESO Press Release 26/04 has been published. In addition to announcing the results of the VT-2004 Observing Campaign , it contains information about the "Venus Transit Experience" conference that will take place in Paris on November 5-7, 2004, bringing together the main participants in this project from many different European countries. A main aim is to discuss the impact of the project, identifying possible differences from country to country and showing how to share good practices in the future. The full report on the determination of the distance from the Earth to the Sun (the Astronomical Unit) by means of observations of the Venus Transit on June 8, 2004, by more than 2500 groups of observers participating in the VT-2004 Observing Campaign, will appear at the VT-2004 website on Tuesday, November 2, 2004. After viewing all the many entries received for the VT-2004 Video Contest, an international Jury has selected 10 laureate videos. The list is now available on this page. The laureates will be invited to the VT-2004 Final Event where the Jury will announce the winners of the top prizes. Congratulations to all of them! Please note that because of the work on the Final Report about the VT-2004 programme, photos related to Venus and the transit event cannot be accepted for inclusion into the VT-2004 Photo Archive after October 15, 2004 . The deadline for receiving entries to our Video Contest has passed and we are happy to report that many videos entered the contest. An international Jury has been set -up and will deliberate on the entries in early October. We hope to be able to announce the winners by October 15. There is still time to participate in the VT-2004 video contest with the great prizes, but time is now getting short! Be sure to read the guidelines and don't forget the deadline on September 15, 2004 ! The VT-2004 Photo Archive now includes photos from all authors who have submitted images. However, due to the very large number of emails received, it cannot be completely excluded that some images were "lost". If you do not find your photo(s) on the 57 pages in the Archive, please send it (them) again to vt-2004@eso.org. In place of the excellent "Photos of the Week", you will from now on find a "Theme of the Week" on this page. During the next months, many aspects of broad the VT-2004 programme will be covered, with direct links to the related pages. Note that we are still collecting material (photos) to be displayed at the VT-2004 website and the resulting VT-2004 DVD that will become available at the end of the year! Please note that the last "VT-2004 Photo of the Day" will be elected and displayed on August 8, 2004, i.e. two months after the event! Photos to be included in the VT-2004 Photo Archive are of course still welcome after that date. The VT-2004 Gallery has been rearranged in order to provide easier access and better overview. There are now a total of 410 drawings on 16 pages, with 25 drawings per page. Note also the link on page 16 to the VT-2004 Drawing Contest in Thailand with many other great works of art! And there are now more than 530 photos in the VT-2004 Photo Archive - more are still coming from around the world! Are you planning to participate in the VT-2004 video contest with the great prizes? The be sure to read the guidelines and don't forget the deadline in exactly two months' time, on September 15, 2004 ! With the announcement of the drawing contest winners (see below), the organisers also asked that the winners and the school classes send their full addresses so that the T-shirts and posters can be delivered. If you have not done this already, please be sure to do it soonest via the VT-2004 email address indicated on this page. Today is the deadline for delivering your timing measurements of the Venus Transit to be used for the calculation of the Astronomical Unit! Just one month after the Transit the VT-2004 organisers have awarded 52 original VT-2004 T-shirts to authors of entries into the Drawing Galleries. And a bonus to all the school classes which participated! See the list of winners here. We have been working hard to place the many drawings and photos received at the VT-2004 website. In total, more than 800 are now available, providing an absolutely unique collection of images and impressions around the Venus Transit. While the Gallery is now complete (the winners will be announced in a few days' time), we are still working on the photos received during the June 17 - 20 period and after July 4. This should be ready soon. We also hope to provide later a second catalogue of the photos ordered by category. Today is the deadline for sending your drawing for the VT-2004 Gallery! Hurry up to join the 375 drawings already present in the Gallery and to have a chance to win a unique VT-2004 T-sh irt. A short note has been added on the calculation of the Astronomical Unit. See this page. The deadline for sending timing measurements of the Venus Transit to be used for the calculation of the Astronomical Unit is July 10. VT-2004 Press Communication 07 has just been released. It will also be distributed through the usual media information channels. A new section has been opened: Writings! Why don't share any poem or essay you have written about the Venus Transit ? Have a look at the writings page for a first collection of nice poetry. Three new videos have been added, showing the Transit. Today's "Photos of the Day" contain exceptional views of the Venus Transit - with two phenomena not present during earlier Venus transits! More information about the photo by Tomas Maruska (Slovakia) with ISS in front of the Sun at the time of the Venus transit is available at his webpage and the sheet with predictions issued before the event. Read also the commentaries on this issue at the VT-2004 Forum. 120 very nice drawings have been added to the Gallery. About 100 photos from the transit received by the VT-2004 programme on June 8 and 9 are now available at the VT-2004 Photo Archive on pages 20-30. More to follow. The VT-2004 team is still receiving many messages - we do our best to follow them up, but it may take a little time - kindly be patient! Some organisers of Venus Transit public events have sent photos and some of these can now be found at the Event Photos webpage. The first ~40 photos from the transit that were received by the VT-2004 programme are now available at the VT-2004 Photo Archive. More will follow soon. The automatic calculation of the distance between the Earth and the Sun (the "AU"), based on the timings of the four "contacts" by observing groups registered with the VT-2004 Observing Campaign continues - you may see the current result here. Until now, 765 groups (out of 2283 registered) have delivered a total of 2213 timing measurements. The resulting value of the AU is only ~5000 km off the true one, an amazingly correct value, also since the dispersion of the measurements is around +-1.8 million km. More observers will deliver their timings during the coming days and weeks, as they evaluate their photos, etc. A post-transit statistical study indicates that the VT-2004 website, as disseminated via AKAMAI mirror sites and ESO's own internet link, delivered a total of about 1.5 Terabyte over an 8-hour period, beginning one hour before the transit started. In the same time interval, there were about 45 million hits at a rate of about 600 Mb/sec and reaching a peak value of 2200 hits/sec. This corresponds to about ten times the volume and rates at the time of the Mercury transit on May 7, 2003. The 2004 Venus Transit is now over! But not the VT-2004 programme. You can still send your drawings (until June 30,2004) for the Gallery with a chance to win a T-shirt and participate in the Video Contest with a chance to attend the Final event and win a trip to Paranal. You can now find all the images of the transit and five videos (Parts I, II, III and IV, and also the Complete Event combining the four parts) showing Venus moving across the solar disc on the Central Display page. Less than one hour to go to the begin of the transit! NB! From now on, all comments by the VT-2004 team will appear at the Central Display page . Two hours to go to the start of the transit! The Sun and Venus have just risen above the horizon in Garching (Germany), the site of the VT-2004 Center. At this very moment, Venus is just 7.3 arcminutes from the limb of the Sun, i.e. 1/4 of the solar diameter. There are 1997 registered participants now. First image has just arrived from the Nehru Planetarium (Delhi, India) - it is now at the Central Display". Waiting for the transit, you may find it interesting to read about twilight phenomena in Venus' atmopshere, as decribed in the article by Italian astronomer Paolo Tanga. Or listen to John Philip Sousa's "Venus Transit March" from 1882? The "Day of the Transit" has begun! At 19:00 hrs UT, there were 1883 registered observing groups with the VT-2004 Observing Campaign. A map of Europe showing the locations of those in this area was added to this page. VT-2004 Press Communication 06 has just been released. It will also be distributed through the usual media information channels. Last year, in ESO's Catch a Star! competition, a group of students made a very nice project on Venus and its phases, with an animation. It is worth a look ! Observers who produce images may like to look at the page about the use of the observations ("Images") and the intention to collect accurately timed images at the IMCCE (Paris) into an educational database. ESO and the City of Garching are organising a public showing of the Venus Transit tomorrow from 07:00 hrs local time at the Bürgerplatz in Garching (Bavaria, Germany), the town in which the ESO HQ are located. Have you prepared yourself for the transit? And did you consider to join the VT-2004 Video Contest, open to everybody, not just the observers? With a free trip to ESO's Paranal Observatory (home of the world's largest optical/infrared telescope) as the First Prize! At 8:30 hrs UT this morning, no less than 1562 observing groups had registered as participants in the VT-2004 Observing Campaign, making this by far the largest internationally co-ordinated effort of its kind. Over 600 of these are school classes (in about 45 countries) and 265 are astronomy clubs, the rest are mostly individuals groups. It is still time to join this unique programme - it would be good to have more observers, in particular in the Russian Federation (especially Siberia) and Africa. Today, at 08:30 UT, Venus is only 3.2° away from the Sun in the sky and the distance to the Earth is about 43.2 million km. The "black drop" phenomenon can be annoying for visual observers when they attempt to determine the exact moments of the 2nd and 3rd (internal) contacts. More information about this effect and how to improve your timings is now available on a dedicated page. Today, at 08:00 UT, Venus will be 5° away from the Sun in the sky and the distance to the Earth is about 43.4 million km. Contrary to a widespread belief, the Venus transit will also be the occasion for front-line research by professional astronomers. At some large solar telescopes, notably the 70-cm Vaccum Tower Telescope operated at Izaña (Tenerife, Canary Islands) by the Kiepenheuer Institute for Solar Physics ( VT-2004 National Node in Germany) and the 60-cm telescope installed in the "Einsteinturm" of the Astrophysical Institute Postdam (near Berlin, Germany), spectral studies will be made to investigate the chemical composition of Venus' upper atmosphere, a region poorly observed until now. This kind of observation is also of particular interest for the study of (transiting) exoplanets and their atmospheres. More details in a NSF Press Release (June 3). Today, a big press event around the Venus transit takes place in Varna, Bulgaria (cf. the VT-2004 National Node in Bulgaria. A major public event is planned in Frognerparken (Oslo) at the time of the transit by the VT-2004 National Node in Norway. The last time Norway was in a favourable position for viewing a Venus transit was in 1283. Venus is now visible in the field of the LASCO instrument on SOHO, see the new image at the "Central Display". A new page has been added to this website that facilitates the establishment of "Observing Partnerships" between geographically widely separated observers who would like to exchange observational data in order to calculate the distance from the Earth to the Sun (the "Astronomical Unit") by comparing their data. This page also includes a useful map that indicates the duration of the transit, as well as the beginning and end (UT) at different geographical locations. A step-by-step calculation form is now also available, with both Halley's and Delisle's methods. Don't take any risks when observing the Venus transit on June 8th! Be sure to protect your eyes in the proper way! Read the Safety Instructions which have just been updated with more information and links! VT-2004 Press Communication 05 has just been released. It will also be distributed through the usual media information channels. One more week to go! And things are really warming up now! Yesterday, 126 new observing teams registered with the VT-2004 Observing Campaign, bringing the total to 1083, of which 431 are school classes with the teachers. The northernmost observer is on Svalbard (Norway) and the southernmost is in Antarctica - see the latest map of the geographical distribution here. There is still time to join this unique programme, but don't wait too long! At this moment, observers in Africa and Siberia are particularly needed. Did you have a look recently at the VT-2004 Gallery, full of impressions around the Venus Transit - mostly by children? Or at the Photo Archive, with a rapidly accumulating trove of excellent images - mostly by amateur astronomers? A new page (reachable via the corresponding button at the "Central Display") has been set up that contains links to other websites at which photos and webcasts of the Venus Transit are expected to appear in (near-)real-time. Many of the organisations responsible for these pages are VT-2004 Network Members. If information is received in time, there will also be (links to) information about radio and satellite-based TV transmissions. Note also the plan to organize HAM radio operators around the world to communicate live via amateur radio on their observations of the Venus Transit. Ten more days to wait until the Day of the Transit! Don't forget to prepare for this unique event! Moving ever closer to the Sun in the sky, Venus has become a very difficult object to observe. Today the angular distance is only 15° and only 3% of Venus' disc is seen illuminated by the Sun. The planet's distance from the Earth is 45.5 million km and its diameter in the sky is 54 arcsec. Photos showing Venus' extremely thin crescent are still being obtained by experienced amateur astronomers, e.g., by Hans-Göran Lindberg (Sweden) on May 24 and Michael Zimmermann (Germany) on May 25. There are now 907 registered observers with the VT-2004 Observing Campaign. Basic Image Processing - available to everybody! Digital images frequently contain more information than is obvious at first glance. We want to help you in getting the most out of your digital camera images, also those of the Venus transit. An easy-to-use facility has therefore been set up at the Ondrejov Observatory (The Czech Republic) where you may submit your images and have a variety of well documented operations performed on them. The results are immediately displayed on your screen. The Central Display area has now been opened. At this moment, only the links are functional, but we will soon begin to show images. It would appear that the southernmost observations of the Venus Transit are being planned at the Australian Casey Station in Antarctica (latitude 66.3° South). From here, the Sun will be only two solar diameters above the horizon at the moment of the Second Contact. It is important to have as large a geographical dispersion as possible of the observers - this will improve the determination of the Astronomical Unit. Let us hope that the weather is co-operative! Venus is now moving rapidly towards the Sun in the sky and observations are becoming increasingly difficult. Today, at 12 hrs UT, the angular distance between Venus and the Sun (the "elongation") is about 22°, Venus' diameter in the sky is 51 arcsec and the distance from the Earth is 48 million km. The crescent is getting slimmer from day to day - at this moment only 7% of the disc is illuminated by the Sun. Venus is seen as a -4.2 magnitude bright point, low in the western sky right after sunset. Higher in the sky, Mars and Saturn have moved closer together, they are now only 2° apart and about 16° from Venus. Yesterday, the young Moon passed in front of Venus for observers in a broad geographical section across Europe and Asia. This event is refered to as a "Venus Occultation" and was followed by many amateur astronomers; some of their images and animations are now available in the Photo Archive. Today's "Photo of the Day" is a "video" of the disappearance of Venus behind the dark limb of the Moon (the "ingress phase"); it is based on images obtained every 5 seconds and covers a period of 70 seconds in real-time. VT-2004 Press Communication 04 has just been released. It will also be distributed through the usual media information channels. Two days after New Moon, the Moon today passed in front of Venus for observers in a broad geographical section across Europe and Asia. 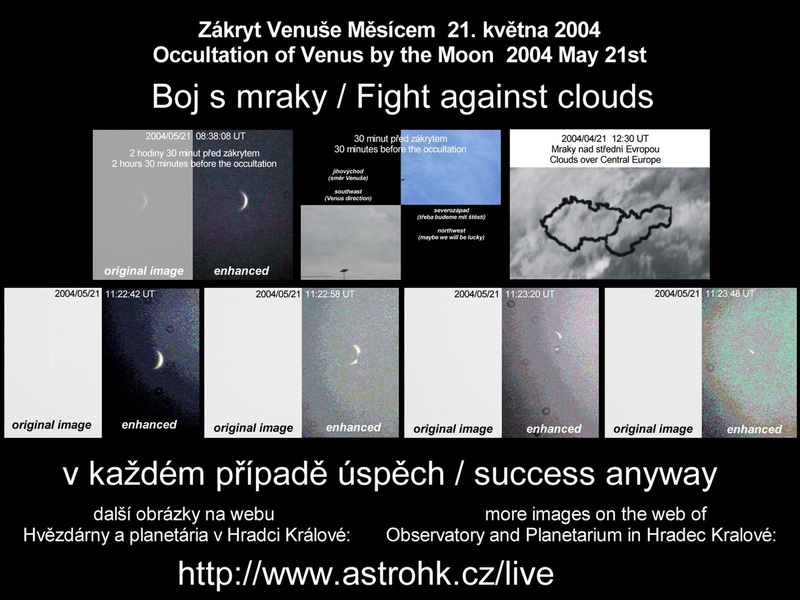 This event is refered to as a "Venus Occultation" and was followed by many amateur astronomers; the first images were received from the Public Observatory in Hradec Kralové (Czech Republic). See also the short video of the disappearance of Venus [the "ingress phase" - Animated GIF - 688k - real-time duration 70 sec] that was prepared by Herbert Raab of the Linzer Astronomische Gemeinschaft (Austria). The "Day of the Transit" page now contains useful advice for anybody who is not a professional or amateur astronomer and who wants to partake in the unique celestial event. Read the step-by-step join-the-transit explanations, with plenty of ideas and suggestions for how to get the most of this occasion!. Observations of the Venus transit will also be made from the SOHO spacecraft. It will see Venus passing in front of the solar corona - see the special webpage. The introductory page for amateur astronomers has been updated with more useful links towards the many pages at the VT-2004 website that descibe fine opportunities for observations and interaction with the general public around the Venus Transit event. Four more animations are now available at the corresponding page, demonstrating the (small) difference of view when observing the four "contacts" between Venus and the solar limb from different geographical locations (Helsinki and Faro). A 40-sec video (VT-2004 Animation F) is now available that shows the "ingress" and "egress" phases of the occultation of Venus by the Moon on May 21, i.e. the disappearance of the planet's crescent behind the dark edge of the Moon and its re-appearance at the bright limb. Two new, extremely hot exoplanets have just been found with the transit method, cf. ESO Press Release 11/04. This discovery provides a very timely demonstration of the power of this method, shortly before the Venus Transit next month. More information about exoplanets is available in VT-2004 InfoSheet E1 and the related talk given by Gero Rupprecht during the Brandys meeting. VT-2004 Press Communication 03 has just been released. It is also being distributed through the usual media information channels and contains, among others, a brief report about the VT-2004 meeting in Brandys, with a link to a new page with many of the reports delivered there. From today till Sunday, about 40 amateur astronomers from 30 countries meet with the members of the VT-2004 Interntional Steering Committee in Brandys near Prague (Czech Republic). This encounter will serve to discuss in depth how observations of the Venus passage can best be done. A report on this meeting will follow in VT-2004 Press Communication No. 3 and the Amateurs' webpage will be updated right thereafter. Venus is at its brightest during these days, at visual magnitude -4.4. It is now about 8 times brighter than Jupiter and over 20 times brighter than the brighest star in the sky, Sirius. From now on, Venus will slowly begin to fade as it moves closer towards the Western horizon in the evening sky. And Venus' crescent now diminishes rapidly, as we see it more and more "from behind". Tomorrow evening's total lunar eclipse will be transmitted live from several sites. You will find a list of webcast addresses at the Astronet website (The Netherlands). VT-2004 Press Communication 02 has just been released. It is also being distributed through the usual media information channels. Detailed "Guidelines for Observers" are now available. They have been prepared so that they will also be very useful for school classes. How much do you know about the Venus Transit ? Try the VT-2004 quiz! Very useful guidelines for observations of the Venus Transit within the VT-2004 Observation Campaign (e.g., by school classes) are described in a Power-Point presentation prepared by Rostislav Halas (Czech Republic). Today, Venus and Mars are only 5.6° apart in the sky - this is the closest they come this time. The Moon has moved on and is now seen above Saturn. On May 4, beginning at about 20 hrs UT (i.e. in the evening in Europe), the Full Moon will take on a deep-red colour when it moves through the Earth's shadow during a "Total Lunar Eclipse". A 28-min TV-programme about the Venus Transit and the VT-2004 Programme is being produced in the Czech Republic (Czech and English versions). Interested media representatives will find more information here (Word). The first in a series of VT-2004 Press Communications ( VT-2004 Press Communication 01) is now available at this website. It is also being distributed through the usual media information channels. In a few days' time, there will be a beautiful view of the Moon and four planets (Venus, Mars, Saturn and Jupiter) in the Western sky. On April 23, the Moon will be close to Mars, and Venus - see how this will look like here. An excellent presentation of the Venus Transit by Robert Wielinga (The Netherlands) is now available ( PPT - Quicktime). The meeting between the VT-2004 National Nodes and the International Steering Committee on April 17 at the ESO Headquarters in Garching (Germany) was very useful. Participants from Norway to Malta and from Portugal to Bulgaria discussed all possible aspects of the VT-2004 programme. An enormous number of activities and events are planned in all of the countries. Many VT-2004 Node websites (in the local languages!) are already very well developed and certainly worth a visit. More details will be announced in a "VT-2004 Press Communication" to be issued in the coming week. A meeting is held today between the VT-2004 Nodes and the International Steering Committee at the ESO Headquarters in Garching (Germany). A new VT-2004 Top Page has been installed which provides a quick overview of the large number of opportunities at this website. There is also a "Photo of the Day" which will feature some of the best images around this event. At the same time, the navigation buttons on the left side have been re-arranged. A Kids' area has been opened with information about the Venus Transit 2004, related stories and nice drawings and photos. A Photo page has been opened that with photos related to Venus and the transit event. Proposals for entries are welcome. Send them to vt-2004@eso.org. A series a four new animations have been prepared and are now available on the corresponding page They demonstrate how the occurrence of a Venus transit event depends on the motions of Venus and the Earth in the orbits around the Sun. The "parallax effect" due to the different lines of sight of observaers who are located at different places is also demonstrated. In order to discuss the observational aspects and other related issues, an international VT-2004 amateur meeting is being arranged in early May in Prague (Czech Republic) between representatives of amateur astronomy groups, societies, etc. and members of the International Steering Committee. Participation is by invitation only. Incidentally, this will be one of the first international meetings in the Czech Republic after its entry into the European Union on May 1st, 2004, and which is supported within an EC programme. In order to further prepare for this event, representatives of the VT-2004 Nodes in two dozen countries and members of the International Steering Committee will get together at the ESO Headquarters (Garching, Germany) on April 17, 2004. During the coming weeks, Venus will continue to be a beautiful sight in the evening sky. Look towards the West soon after the Sun has set and you will see a very bright point of light in the sky - you will have no doubts if the sky is reasonably clear - this is Venus. Other planets are visible in this direction. 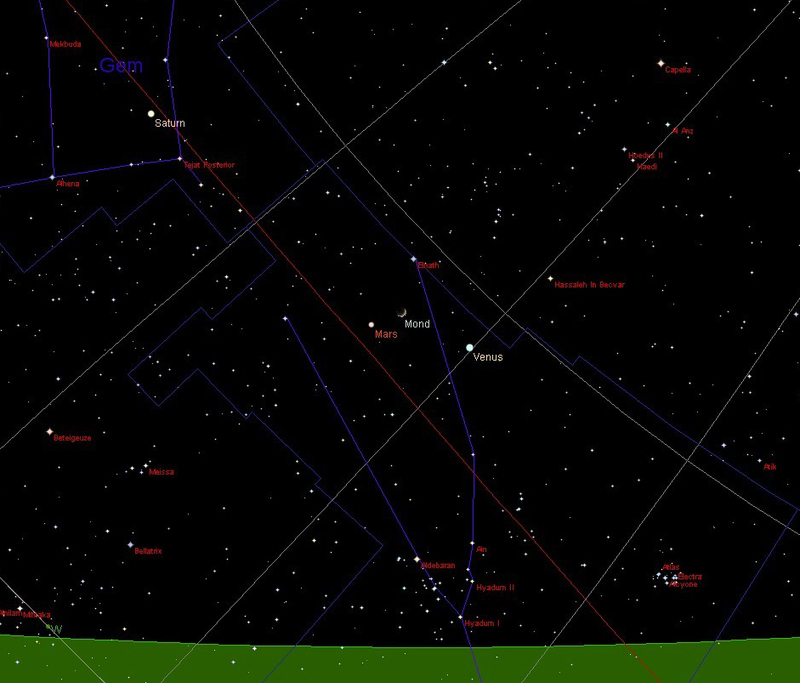 A special event will happen on April 22-23 when Venus will be close to the crescent New Moon. You will find more information about all of this, e.g. at the Sky & Telescope website. 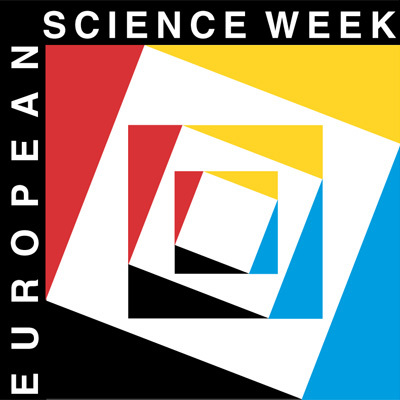 A meeting took place at the ESO Headquarters (Garching, Germany) on March 11-12, 2004, with participation of representatives of the media (printed press, TV, etc.) and the members of the VT-2004 International Steering Committee. This encounter was very timely in view of the rapidly growing media interest. It served to discuss in detail the needs of the media in order to spread information about the unique Venus Transit event in June and also about how to make the VT-2004 programme better known in- an outside Europe. Many good ideas were brought forward which will now be acted on during the next weeks and months. The official launch of the VT-2004 website and the simultaneous publication of a comprehensive Press Release has just taken place. Visit the new VT-2004 website on that day and discover many exciting aspects of this large-scale public education programme! A meeting took place in Mondorf-les-Bains (Luxembourg) during the week-end (January 23-25,2004) with participation of about 30 physics teachers from secondary schools in about 25 European countries and members of the VT-2004 International Steering Committee. It served to define in some detail the content and format of the educational material that will be published at this website and help teachers and students to engage in activities in connection with the Venus Transit. More news about this important issue will follow soon. Please note the series of pages that provide access to current lists (by countries/regions) of the many educational institutions, organisations, associations, planetaria, astronomy clubs, etc., which are officially associated with the VT-2004 programme as members of the VT-2004 Network . The links to their websites will help you to learn more about the activities around the Venus Transit event in the corresponding geographical areas. If your organisation plans activities in connection with the Venus Transit on June 8, 2004, and wishes to join the VT-2004 network, please send an email with the name and address, together with information about those activities as well as your URL for the link from the corresponding (country/region) page, to the VT-2004 programme organisers at vt-2004@eso.org.